There are certain tiny experiences that we all share, such as walking in to a room all full of purpose and, as we walk through the door, forgetting entirely what we went in for. Or seeing faces in the wood grain, that were certainly not there the day before. Personally, I am entirely incapable of keeping socks in pairs for any amount of time at all. Like most people, my oh-so human mind has always filed these events away under “coincidence” and moved on. That was before I learned that hidden in a world within our own, where the dimensional borders happen to be a bit more porous than we realize, there live a multitude of species responsible for these occurrences, commonly known as house creatures. 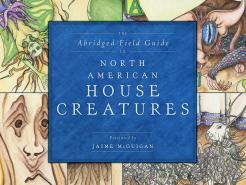 Serving as an introductory guide to this half-hidden world, The Abridged Field Guide to North American House Creatures provides a fully illustrated, in depth look at all the available scientific, historical and anecdotal evidence about twenty-five of these evolutionarily astonishing creatures. Not only house creatures live in these pages though and along the way you will meet thirteen of the most influential people to investigate them, people whose lives are inextricably linked through their discoveries. Among these researchers are a children’s etiquette writer from the 17th century, a lovelorn and slightly mad inventor from the late 1800s and a female oil company geologist who went on to become a champion of the environmental movement in the 1970s. Jaime McGuigan is an author/illustrator and botanist turned chemist, who wishes she never had to sleep. She lives in a rattling, clattering old farmhouse in New Hampshire, surrounded by lovely but unruly gardens. There she has taken up with two very stubborn dogs, two terribly moody cats and one perfectly lovely husband. You can sometimes catch her on twitter where, let’s be honest, she posts a lot of pictures of her dogs but sometimes new illustrations and projects too. She can be found under her telemarketer-inspired username @JMcGooligan.